An original 1956 4x5 negative of the 1956 IBM 608 transistor calculator. 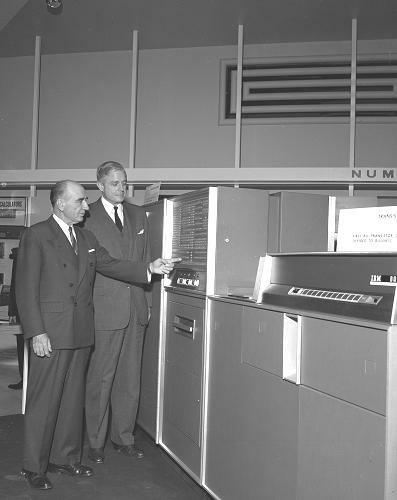 Major Lennox Lohr and Thomas Watson, president of IBM, examining the new IBM transistor calculator. It was the first all-transistor calculator offered to businesses. The machine could compute 9300 checks per hour. The photo was taken at the Museum of Science and Industry in Chciago, December 12, 1956.